Long time no see, guys! Let's see if I remember how to do this whole blogging hobby; it's only been two months since my last post. I could have written a thing or two here and there, but truth be told, my life has been pretty routine since I returned home from the states. Landon started preschool, Evie has begun the potty training journey, and we're down to mere weeks before Alex returns home. There hasn't been too many exciting adventures lately, but never fear! Once Alex is back, we plan on hitting Europe hard. There's a panic that hits you when you realize time is dwindling, and since then I have developed this overwhelming need to cross more items off my bucket list. I need to travel more, cross more borders, see more cultures! 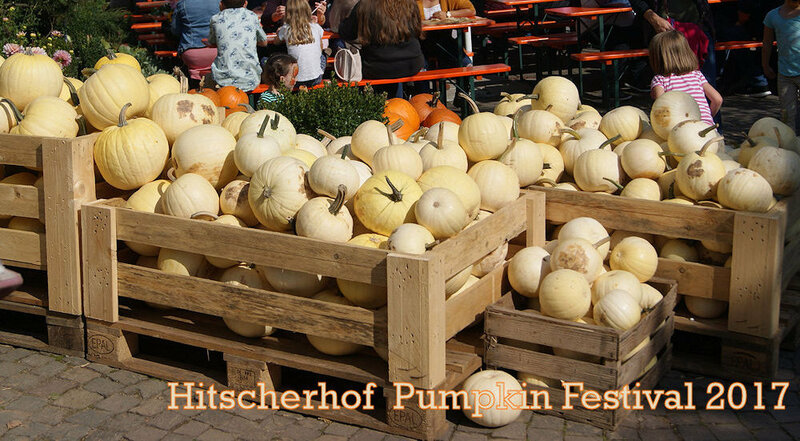 For now, however, I settled for a pumpkin festival in good ol' Germany. This was our second year attending the Hitscherhof Pumpkin Festival. Wait - we've been here long enough to repeat an event?!? Weren't we just stepping off the plane, newly arrived? Man, time doesn't just fly over here, it explodes through space without giving anyone a chance to grab on. Not only was this our second year going to the event, the kids and I also went with friends. This is going to sound silly to anyone but a military spouse, but you know you've established your life in a new location when you start going to happenings with other people. Not just run into people you know at events, but genuinely make a plan and formulate a day out together. Blame it on Alex's deployment, blame it on being overseas without family, blame it on whatever you'd like, but I have created a life for myself here faster than I have anywhere else. I covered most of the highlights of the Hitscherhof Festival in my blog update last year, so I'll just touch on the major change that occurred this year. Rather than walk up to the food booths and pay for your selections after ordering, you had purchase tokens from one of the three booths set up along the main road. The tokens - paper tickets worth varying amounts - allowed you to get the highlighted dishes of the event. Brats, pumpkin waffles, drinks, and my personal favorite - the pumpkin soup. My friend and I stood in line with the kids for over an hour waiting to redeem our tokens. It was a long wait and required a bit of patience, but fortunately the kids were troopers and didn't give us too hard a time. They were practicing for their Disney trip together. A poor woodcutter had set up shop adjacent to the line and had to deal with all the kids pawing at their wares. Poor folks, they had to get sick of seeing little hands all over their work. Then again, the items on display were in the hundreds of Euros price range, so perhaps they were hoping one of the little gremlins would break a piece and force their parents to buy the damaged good. In that case, smart business tactic. Yes, that would be my kid tempting fate. I had heard the wait wasn't as bad if you got to the festival early, but honestly I didn't think we had arrived that late. We were at the entrance by 11:45 with the festival opening at 11. Guess next year, we'll make sure to get there before the entire thing even starts in order to help expedite our day. We finished with the token booth at 1:25 pm and promptly went to the food building to grab our lunch. Ideally, we would have grabbed pictures of the kids BEFORE feeding them, but I think the four small humans were close to banning together and leading a revolt. They needed some grub right away. Because my kids are not adventurous eaters, I had actually packed them a lunch. They chowed down on sandwiches while I got to enjoy a pumpkin soup all to myself. That soup was worth the hour and a half wait. The same can't be said for a lot of things, but I firmly believe this soup is fall in a bowl. It's warm and sweet and creamy and brings the season to fruition for me. I was still holding on to summer with a stubborn resistance, but after I took a few bites of the soup I couldn't help myself. I wanted to watch a Halloween movie later that night, set up my decorations, help the kids pick out pumpkins. Which is exactly what we did at the conclusion of lunch. The kids found the area dedicated to pumpkins of all shapes and sizes and refused to settle down for five seconds in order to let me take a picture of them together. Such a shame, because last year's was so cute. Is that even the same Evie?! Look how she's grown since 2016. Slow down, girl! My brain can't keep up with all your developments and changes. Landon and Evie searched through the piles until they both came away with the perfect pumpkins to take home. Their selections only weighed a combined two kilograms, which meant I only had to drop two euros on them. Wasn't too keen on the realization that I had to shove them in my backpack approximately five seconds after paying for them, though. Next year, we're bringing a wagon. I loved the "pumpkin patch" if you want to call it that, but I do wish it was a little bigger. It was such a cute setup but tended to get crowded and overwhelming when more than a few families were perusing around. My friend and I attempted to get a picture with all four kids together, but anyone that's ever dealt with children before knows we would have had better luck herding cats. After that lovely money maker of a shot, we took a tour through the booths and glanced at some of the items for sale. A secret part of me wanted another basket, because Evie has commandeered my last one, but I resisted. I've got a bazaar coming up and need my spending money for Belgian chocolate and Italian wine. Near the exit of the festival, the kids found a small hill next to a corn maze and used the space to burn off some energy. Landon rolled down the hill over and over, picking up on the activity on his own. Guess it's an instinctual thing in a kid's brain. You see a hill, you feel the pull to roll down it. Before he got too many grass stains on his pants, I made him sit next to his sister to try to get one decent shot out of the whole day. This is my lot in life now, I suppose. Distracted kids and incomplete photos. My photo albums are going to be great. My party left the festival around 3:30pm and made the two hour drive home. I wish this event was closer to my home, because I thoroughly enjoy it but it's hard to justify driving so far for pumpkin soup. That being said, I don't doubt my family will return next year for a final time. And I'll be here with another blog post about it when we do.